Shallow water. Margins of lakes and ponds, sloughs, marshes, fens, ditches, slow streams. Full or partial sun. This is an erect, perennial, emergent, aquatic forb that rises on a rosette of leaves and a single flowering stem from a tuft of coarse roots. It is found in water up to 5′ deep and emerges above the water up to 18″. The roots are tipped with starchy tubers (corms). The plant spreads by long, creeping, above-ground, horizontal stems (stolons), and it often forms dense colonies. 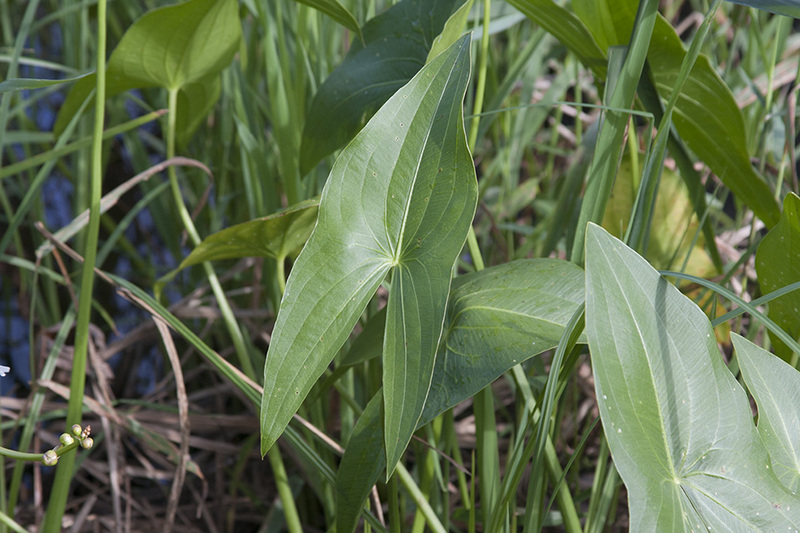 The leaves emerge from the water on long stalks (petioles). 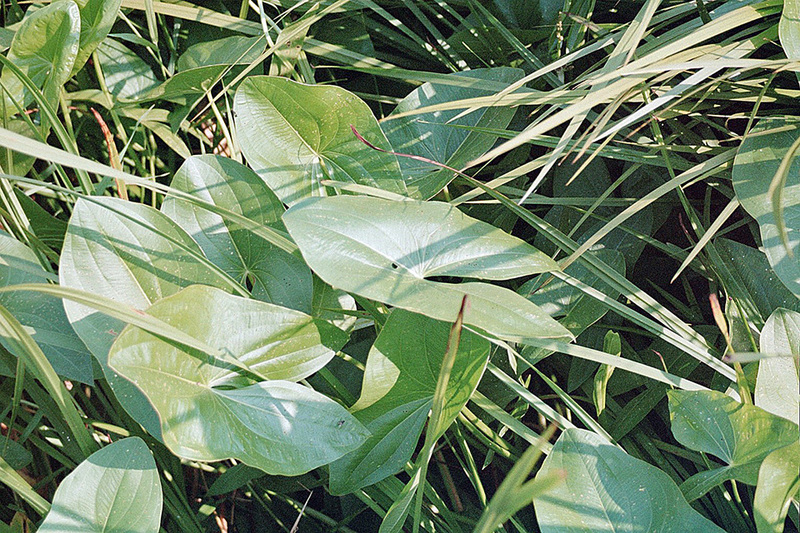 The petioles are stout, erect to ascending, and about as long as the water is deep. They are triangular in cross section for most of their length, round near the base. They are somewhat inflated and sheath the stem at the base. The leaf blades normally held above the water (emersed). In the rare occurrences when the leaves are submerged the blades are absent or are very long and narrow (linear). When emersed, the leaf blades are arrow-shaped, 2⅜″ to 20″ long, and ¾″ to 3¾″ wide, though they are usually no more than 12 long″. The blade width is variable—it may be long and very narrow, with almost linear lobes, or wide with broadly elliptic or egg-shaped lobes. The lobes at the base of the blade normally point downward, rarely outward, and are half as long to as long as the rest of the blade. The tip of the blade is pointed and the tips of the lobes, when present, are sharply pointed. There is a prominent primary vein (midrib) extending from the base of the blade to the tip, and, when lobes are present, form the base of the blade to the tip of each lobe. There are also several slightly less prominent secondary veins arching from the base of the midrib to the tip of the blade and each lobe. These main veins are connected by numerous faint parallel veins. 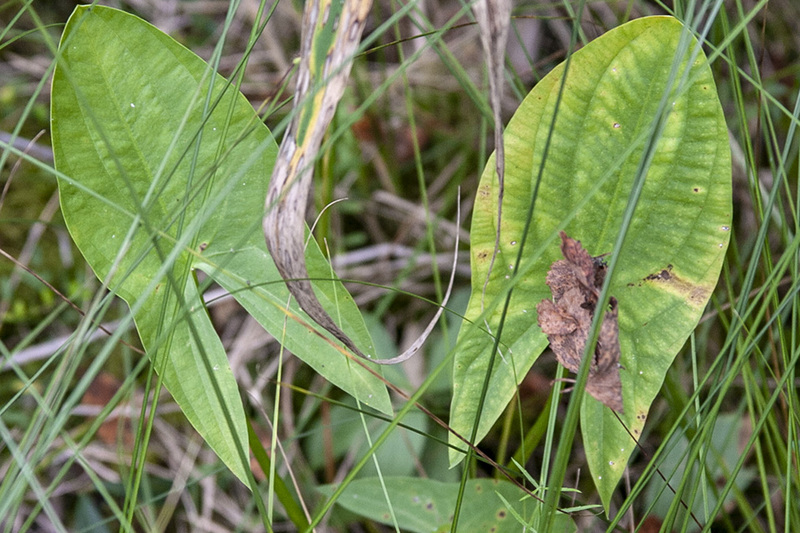 The upper and lower leaf surfaces are hairless or sparsely hairy. The margins are untoothed. The inflorescence is usually an unbranched array (raceme), rarely a branched array (panicle), of 3 to 9 whorls of mostly 3 flowers per whorl. 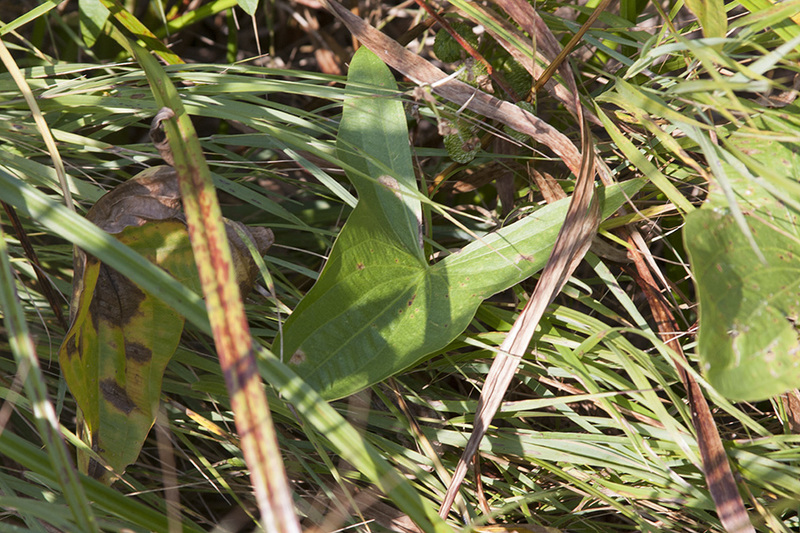 The flowering stalk (peduncle) is slender, unbent, and erect. 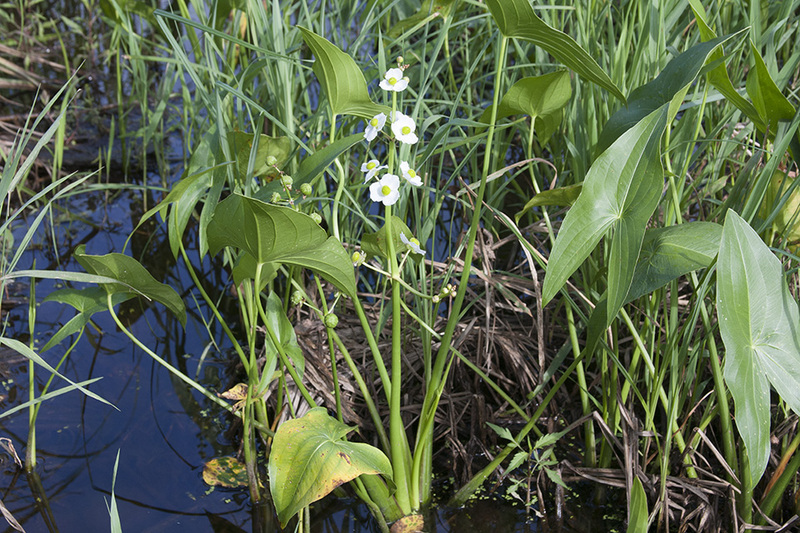 It rises 4″ to 24″ above the surface of the water, often rising above the leaves. Separate male and female flowers occur on the same plant. Each flower is on an ascending, unthickened, ⅜″ to 2⅜″ long stalk (pedicel). The flowers in the upper whorls are male and are on short pedicels The flowers in the lower 1 to 5 whorls are female and are on longer, ascending pedicels. At the base of each pedicel there is a single, leaf-like appendage (bract). 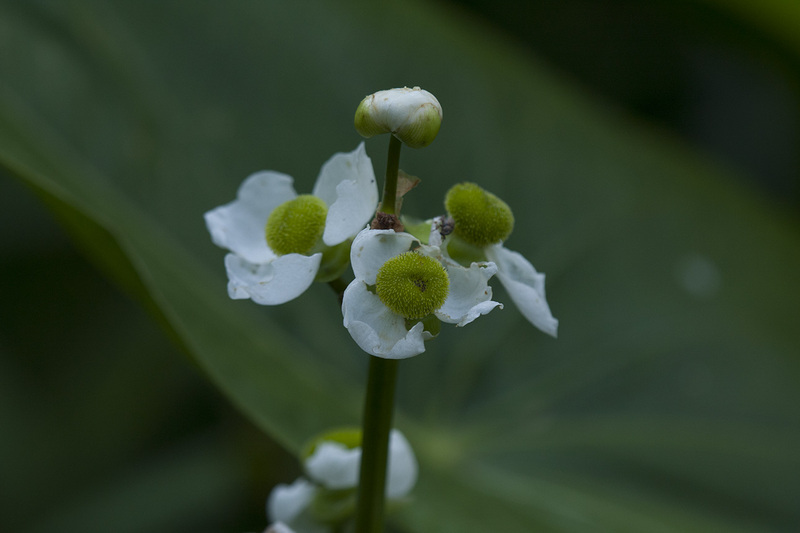 The bract is boat-shaped and ⅛″ to ½″ long. It is broadest at the base and rounded or narrowly pointed at the tip. 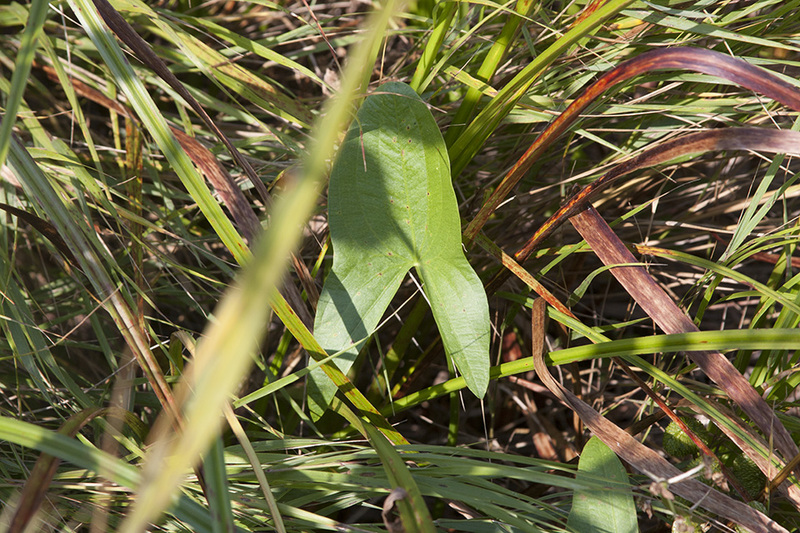 It is fused at the base for at least ¼ of its length with the other bract(s) at the base of the whorl of flowers. Each flower is showy and up to 1½″ in diameter. 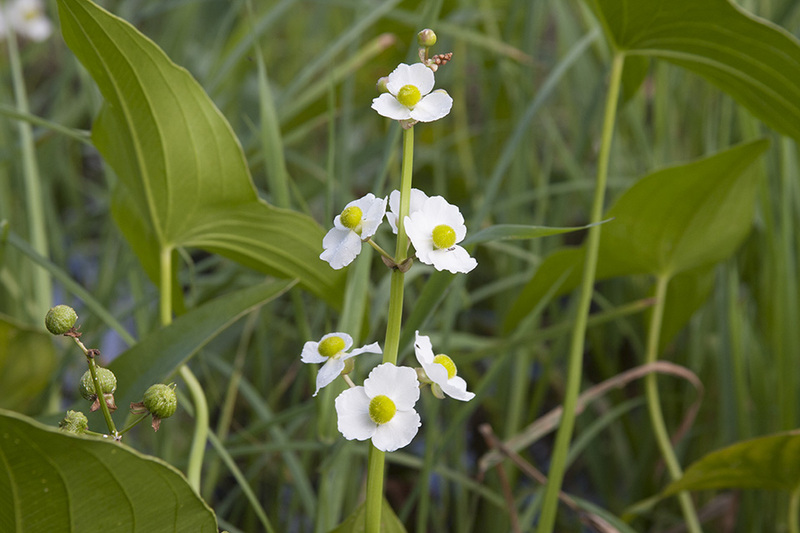 There are 3 sepals and 3 petals attached to the base of a globe-shaped receptacle. The sepals are pale green, egg-shaped, and 3 ⁄16″to 7 ⁄16″ long. They spread outward or are bent backward in flower and are always bent backward in fruit. 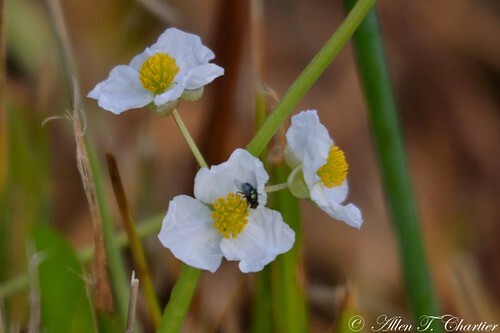 The petals are white, unlobed, and ⅜″ to ¾″ long. On the male flower there are 20 to 40 stamens with yellow anthers. The filaments are hairless, are longer than the anthers, and are not swollen at the base. On female flowers the receptacle is covered with 1,500 or more pistils. The pistils are arranged in a spiral pattern. The female flower does not have a ring of sterile stamens. The fruiting head is a globe-shaped, ⅜″ to ⅝″ in diameter cluster of seed cases (achenes). The achene is inversely lance-shaped and 1 ⁄16″ to ⅛″ long. It is ribbed but not winged. At the tip of the achene there is a conspicuous, 1 ⁄32″to 1⁄16″ long, prolonged tip (beak) that is at right angles to the body of the fruit. 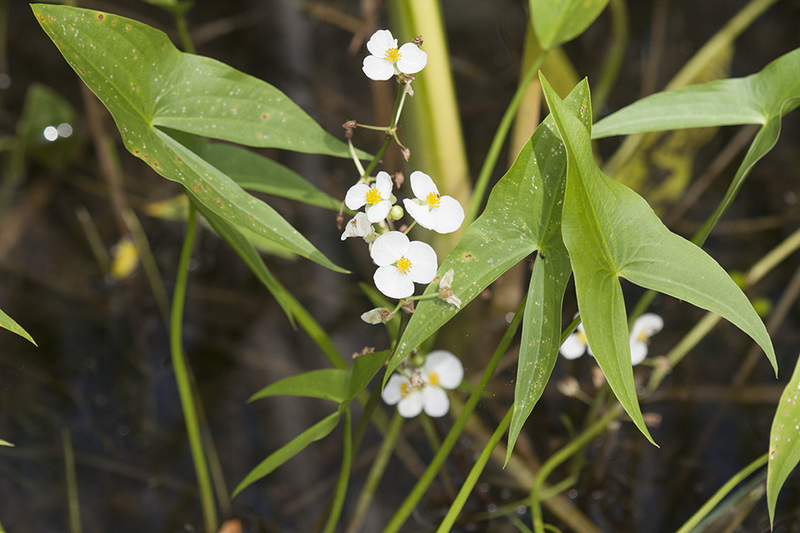 Arum-leaved arrowhead (Sagittaria cuneata) has submerged, floating, and emersed leaves. 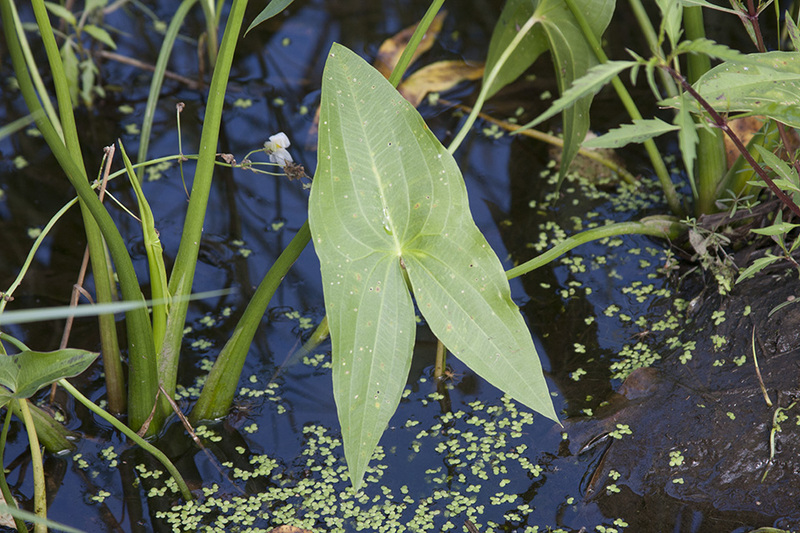 The floating leaves are arrowhead-shaped and are much smaller than the emersed leaves, no more than 3½″ long. The lobes at the base of the blade are much shorter than the rest of the blade .The beak on the fruit is ascending to erect, not perpendicular, and is no more than 1⁄64″ long. 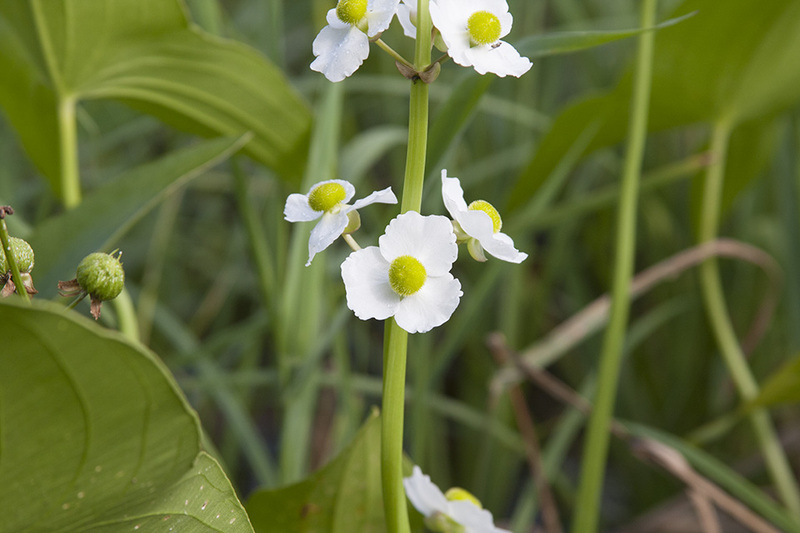 Sessile-fruited arrowhead (Sagittaria rigida) inflorescence is abruptly bent at the lowest whorl of flowers. 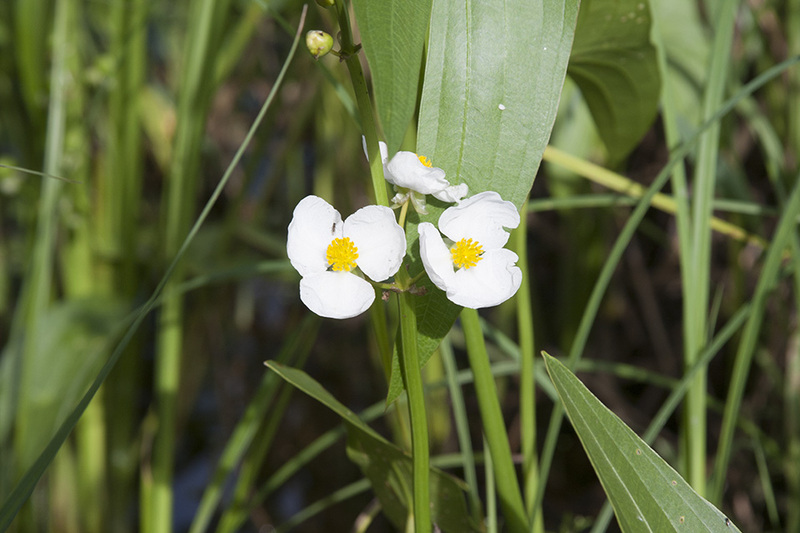 Hooded arrowhead (Sagittaria montevidensis ssp. calycina) has bisexual and sometimes also male flowers but no female flowers. The bisexual flowers have a ring of sterile stamens around the receptacle. The sepals are appressed or ascending in fruit. A comparatively short and stout, narrow or prolonged tip on a thickened organ, as on some fruits and seeds. A short, solid, vertical, thickened, underground stem that serves as a storage organ. Rooted in water but with most of the growth held above the surface of the water. In plants: the stalk of a single flower in a cluster of flowers. In Hymenoptera and Araneae: the narrow stalk connecting the thorax to the abdomen. Aquatic and Invasive Plant Identification Series by the UF/IFAS Center for Aquatic and Invasive Plants ( http://plants.ifas.ufl.edu ) and the Florida Fish and Wildlife Commission, Invasive Plant Management Section. Also called duck potato, Indian potato, or wapato. This plant produces edible tubers that were extensively used by the Indigenous peoples of the Americas.